We made it through the first day with a BANG! Thank God. Sunday was quite the scene here on the island as we hosted hundreds of people (this coming from an operation that is full serving 30 people) and Saturday Barry and I went to our first house party in Belize…so needless to say after a weekend of parties it was a bit taxing to get up this morning….. BUT WE DID IT! 6:45am the school boat left and all kids were dressed to the nines in their uniforms and ready to face the day! Emma, Lilly, Jessica and Ronnie on the school boat with Carlos and Maria. Not really wanting to stop for a picture… The girls walking into school. Lilly and I in her classroom. Emma in her class, of only 17 students!!!! Love that. Today Emma started Standard 6 (8th Grade) and Lilly began Standard 4 (6th Grade). 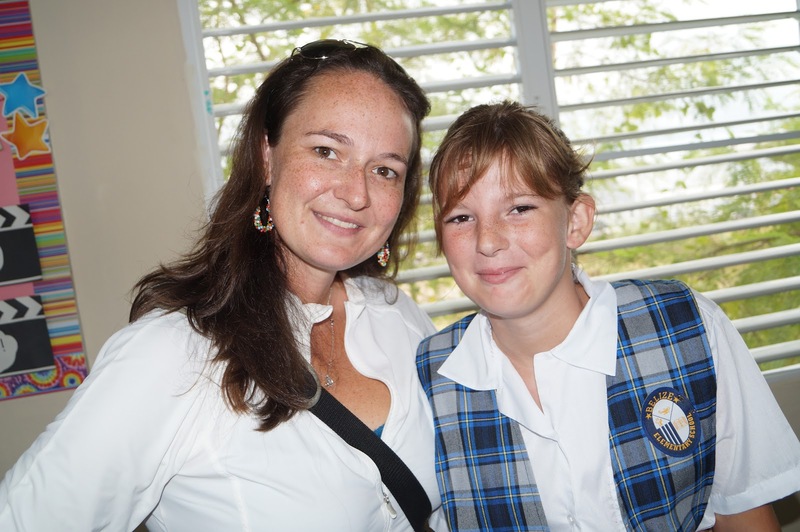 The Belizean school system reflects its British roots. There are two levels of education preceding University; Elementary and High School (called college in many places here). The girls are both a little dissapointed that they still attend a school with the word ‘Elementary’ in the name. I like it. 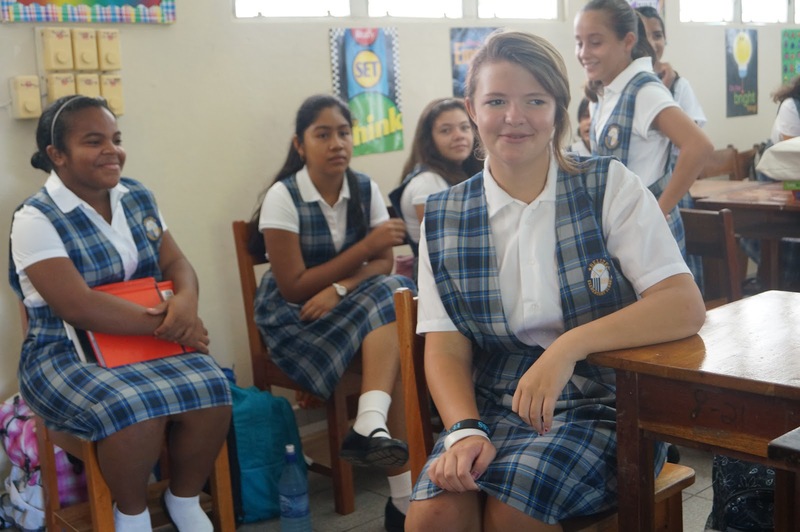 I like so many things, thus far, about their educational and cultural beginnings in Belize. Let’s start with uniforms. Um, yes please. Parents, uniforms at school are amazing. It truly does help the students focus on what they are at school to do… LEARN. And for teenage girls it takes the opportunity away from them to judge each other by the way they dress. No makeup is next on my list of favorites for the same reasons I gave for loving uniforms. It has been so wonderful to see my 13 year old student, a beautiful young lady, actually look like a beautiful young lady. And not a fully eye lined, eye shadowed, face powdered, mascarra wearing, wanna-be some kind of person she can be when she’s in college. Before classes begin all the grade levels so this same thing. When the bell rings all the students file out into the hallway and form two lines, boys and girls. When the teacher prompts the girls, followed by the boys, file into the classroom and quietly sit down to officially begin the day. Another thing I like, in contrast to the schools in the States, is that the students all have rotating “duties”, better known to Americans as chores. This is part of school, taking care of your community together. Janitors do no lurk behind every corner sweeping and wiping up behind them. (Although our housekeeper at home does that for the girls even though I ask her not to!) The students clean up themselves. 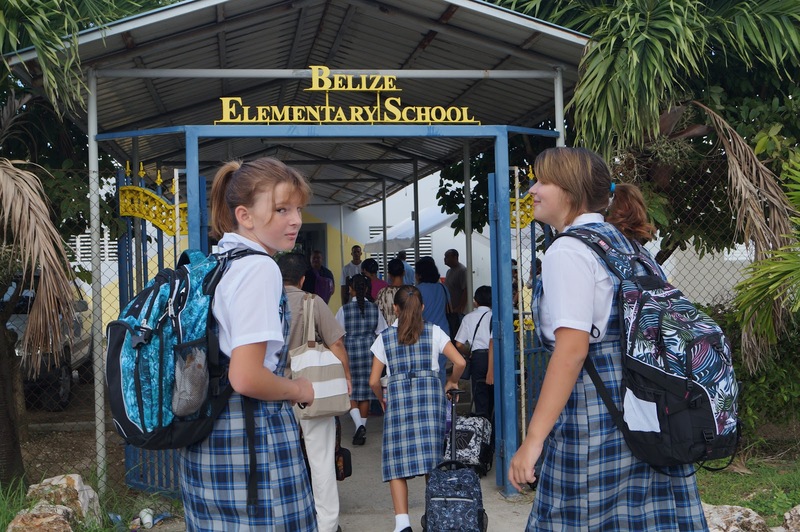 We are fortunate enough to be able to afford what is considered the BEST elementary school in Belize. Many of the elite families in the country send their children here. And many families sacrifice greatly to send their children here. It is an international school with students from all over the world. The parents I have met are from Germany, Bulgaria, Honduras, and England. Oh, and one from the US too 🙂 For now, this is all I’ve got. Thank you to all our family and friends thinking of us during this transition back to school for the girls. And thank you to our new family and friends in Belize for welcoming us and accepting us into your world here. We are most grateful for all of you. I am so enjoying your blog. You have grown into quite the amazing young woman. I am more than a little jealous that you are brave enough to live your dream. School in Belize reminds me of school in Japan where the kids bring cleaning supplies to school and all have cleaning tasks. No janitor. They also have school uniforms and there is a system where the kids maintain good order. What a wonderful opportunity your girls have. Write more about the school and the girls' experiences. I really enjoy reading your blog. The pictures are awesome! My nieces and my sister — love and miss y'all more than words can say. It is so wonderful to hear the experience is turning out so positive!! My heart is full of joy for my family but it is also full of longing because I miss them so much.